A sample of what one "hot hole"
The old adage suggests that no matter what we have going for ourselves, the good things must come to an end. As the month of March marches on the ice season is slowly melting away for us here in Iowa. The ice has been gone or unsafe in the Independence area for several weeks, so traveling north has been necessary to keep Mother Nature at check. This past weekend sent me back to Clear Lake to chase down the Yellow Bass, I think I may be addicted to these feisty fish. They are fun to track down and haul through the ice, I just can't get enough! This weekend proved to be the latest I have ever ice fished in Iowa, March 17th. Not only was the ice safe, we were able to utilize the snowmachines once again this weekend to cover a lot of ice on Clear Lake. 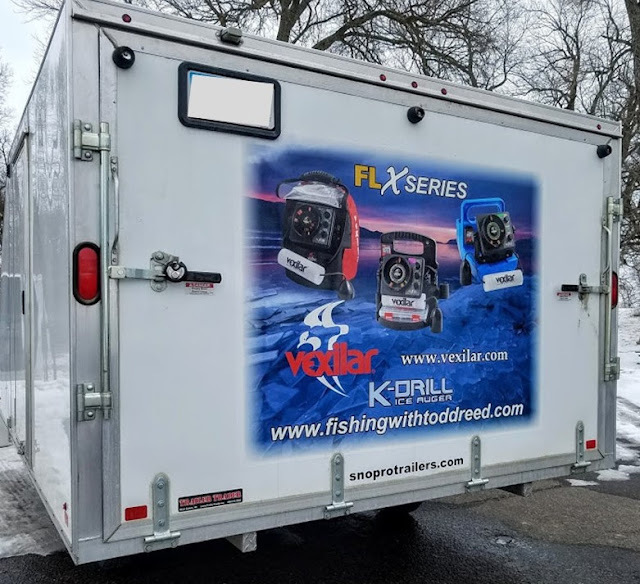 I once again was fortunate enough to meet up with other anglers, David Gissell joined me on the trip, and Jim Klever and Mike Lenius joined us on the ice too. I also got to catch up with with some Central Iowa anglers I only see a couple times a year, Curt Dvorak and Joey highland. It is always icing on the cake when you can see friends out while catching a few fish. It has been great fishing with these guys this year as well as many other ice enthusiasts. Typically in March you are walking on pins and needles to get out on the ice, but not this year. The fishing was fantastic, bouncing from one hole to another dropping the Vexilar FLX-28 down hundreds of holes throughout the day. The day yielded 5 buckets of fish for our group of 4 anglers, countless laughs and hooksets made the day one to remember. The fillets will be tasty very soon and serve as a reminder of yet another reason why to sample the ice fishing at Clear Lake. This was the last go-round on the ice, as the open water bass are calling my name...oh I think that one was a smallmouth, I better wrap this up! All packed up until the water freezes once again, it was a GREAT 2017-18 ice season! assume he wants to go back next year! 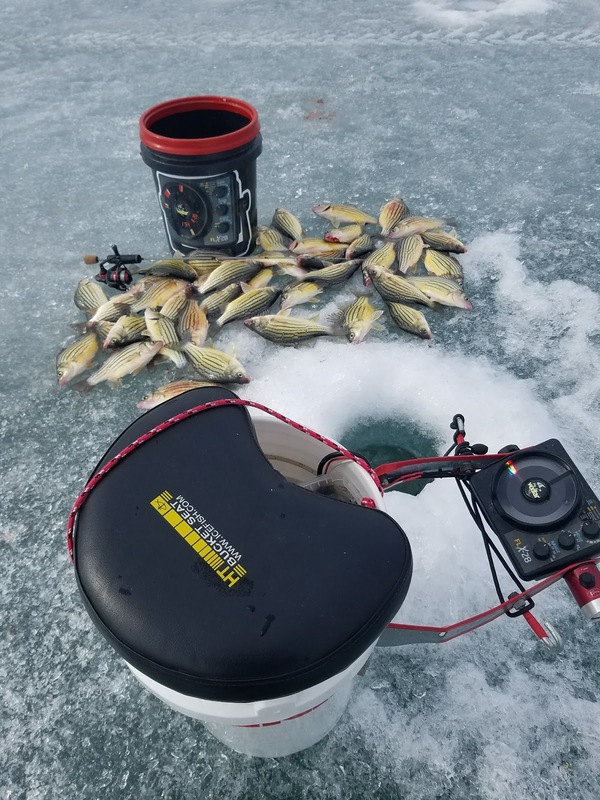 Thousands upon thousands of ice anglers flock to Clear Lake, Iowa each winter in search of gold, gold as in Yellow Bass. These feisty fish are a blast to catch, they are known to knock your bait harder than any other fish, and test your drag on every hookset. Clear Lake itself can be a beast to tackle on your own because of its size. There are several access points that will get you on the "big lake" or the "little lake", also called Ventura Lake. Even though the lake is large, walking can easily put fish in your bucket, however using an atv, utv, or snowmachine will help your chances. Yellows can be found all over the lake at any day. They are very nomadic fish and anglers wanting to ice a bunch of fish must stay on the move. 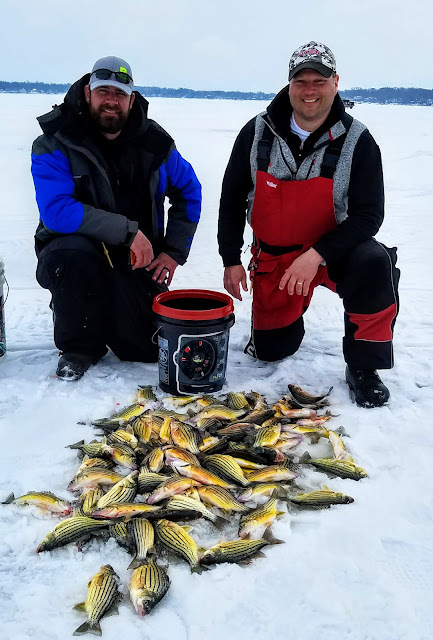 Another big attraction of the "gold" in Clear Lake is the amount of yellow bass you can keep...there is no limit on the number of fish you can keep. They are an invasive species and if anglers do not harvest their catches it will harm the ecosystem of the lake and fishing will suffer for all species. More info on the Iowa DNR site HERE about the Yellow Bass. With the no limit, anglers will keep a 5-gallon bucket full on a good day. They are very tasty in many ways. Fried, or as part of fish chowder are my favorite ways to enjoy yellow bass. Jigs or spoons work well for these fish and it is really about drilling as many holes as you can to find them, once you find them it can make for an awesome day of catching. Spikes, waxworms or cutbait all work at times, experimentation is needed to find what the fish really want. If you are a Clear Lake newbie or rookie, stop in at Clear Lake Bait and Tackle and they will get you the bait you need and point you in the right direction. This past weekend brought many lakes with no or very unsafe ice, so north I had to go to find some good ice. Clear Lake had well over 15 inches of ice everywhere we drilled in the two days. 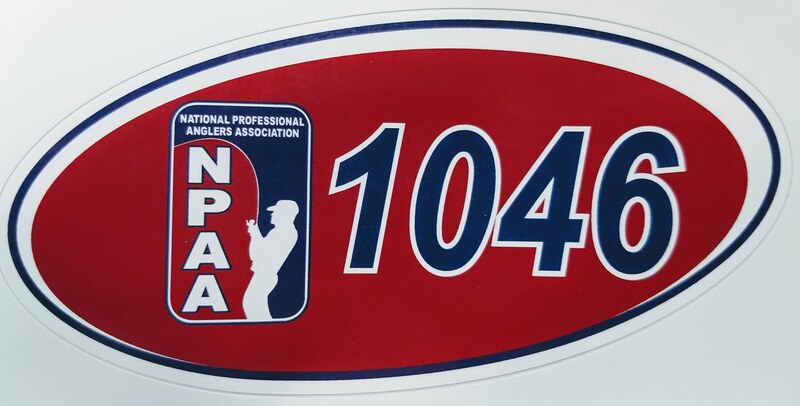 There were quite a large numbers of anglers out on Saturday, many large groups of anglers working together and having a good time. The group I met up with fished the little lake and big lake throughout the day catching yellows on both with a few crappies mixed in too. Hopping from one hole to another looking for yellows hovering over the lake bottom was key to catching many fish. 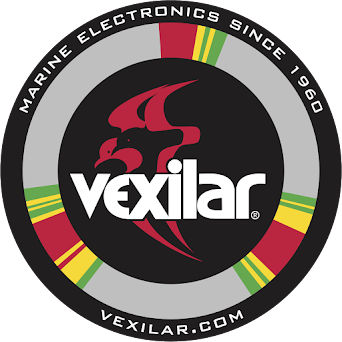 Moving around and checking countless holes with the Vexilar FLX-28 made this easy. The instant readout kept me going from hole to hole until I found the magic one...then the bite was on. Fishing in a group is fun and can really help when fishing Clear Lake, I crossed paths with many friends this weekend and met a couple new ones along the way. 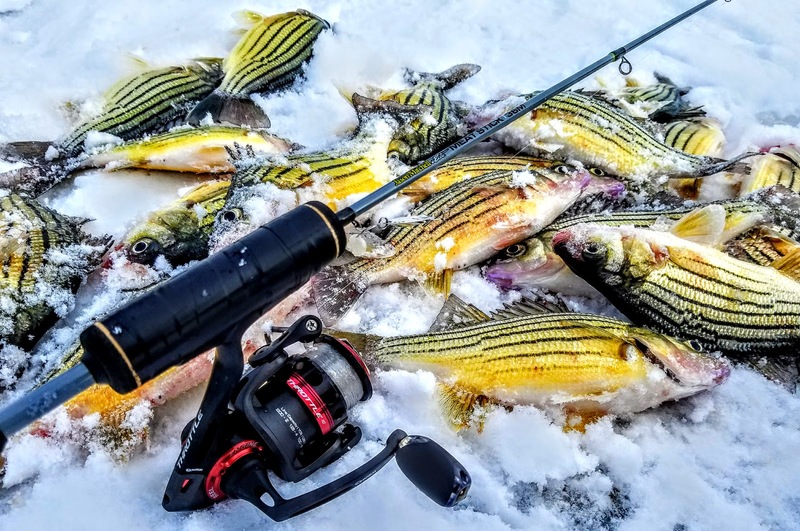 Some yellow fillets in the freezer, and another fun trip on the ice with friends catching fish...perhaps for the last time of the year...perhaps.